Are you curious how shoes are made? Have you ever wondered how to pattern a 3D object? Are you interested in learning about ‘lasts’—the solid form around which a shoe is molded? Join the University of Oregon Sports Product Management program for a three-hour workshop on last patternmaking. The creation of a last pattern is the first step in making properly fitted, functioning shoes. This is the fundamental start of shoe making for designers, technicians, or students in the fashion industry and beyond. 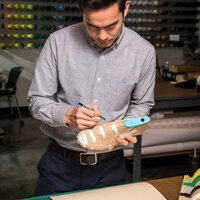 Learn more about footwear lasts, and create a last draft using the adhesive tape method.